By keeping the track of advanced market development, we are engaged in manufacturing and supplying of super quality BOPP Packing Bags. The offered bags are preferably manufactured for packaging applications using premium grade raw material and innovating techniques. We take several measures to ensure that the offered products are in compliance with industry standards. Furthermore, we offer various specifications for these bags to meet exact requirement of clients. 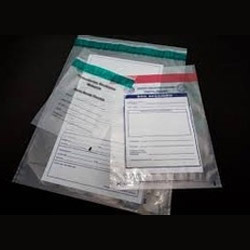 We are extremely emerged in offering BOPP Packing Bags, made available in various customized options as per specifications of our esteemed clients. These bags are manufactured using superior quality raw material with the help of latest technology in conformity to set industry quality norms. Extensively demanded by our clients, these bags are available with sealing features. Moreover, we provide these bags to our clients at cost effective prices.